Do you believe in theater, friend? Or has your faith been strained to the breaking point? If so, I say unto thee, go forth to the tabernacle otherwise known as the Eugene Oâ€™Neill and receive, full in the face, a new testament from the rude prophets of South Park, Trey Parker and Matt Stone. The Book of Mormon, arriving after months of hype, somehow delivers even more than its ridiculously felicitous advance buzz promised: Itâ€™s an often uproarious, spiritually up-tempo satire not just of Mormonism, and not just religion in general, but of (no kidding) Occidental civilization itself, in all its well-intentioned, self-mythologizing, autoerotically entitled glory. Mormon chipperly shitcans all pieties â€¦ except the sacred, mystic conventions of musical theater. And therein lies the real miracle: With muscular assists from clued-in co-director and choreographer Casey Nicholaw and Avenue Q co-Â­composer Robert Lopez, Parker and Stoneâ€”the sincerest, most serious-minded of social comediansâ€”have effectively closed an irony wormhole that opened with Urinetown, grandpappy of all millennial metamusicals. After Mormon, I like to imagine, the Broadway musical might be free to be a Broadway musical againâ€”even if it is balls-out funny and relevant to audiences under 85. 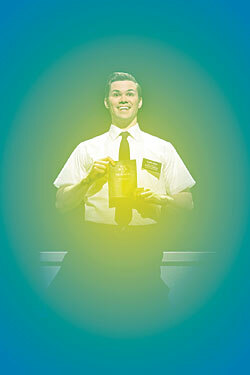 Elder Price descends into full spiritual crisis, experiencing a â€œSpooky Mormon Hell Dreamâ€ that blows open the sleeker, fleeter second act with enough comedic force to prolapse the average diaphragm. (Act one, funny as it is, is mostly scene-setting and throat-clearing.) Meanwhile, Elder Cunningham connects with a fellow escapist, the naÃ¯ve Nabulungi (Nikki M. James), and finally discovers a use for his yarn-spinning skills. In the tradition of all great religions and their close kin, crossover fan-fiction, Cunningham wins converts by customizing American Mormonism into something better suited to Ugandan realities: His reconceived LDS gospel involves dysentery, clitoral mutilation, Mordor, and the Starship Enterprise. And letâ€™s be clear: None of these kids is much deeper than a South Park cutout. Nor need they be. For Parker and Stone, all concepts, characters, and even beliefs can be comfortably reduced to two dimensions, and thatâ€™s more than enough to get the job done. Is the show a reductionist attack on MormonÂ­ism? Or on every religion? Itâ€™s the wrong question, really. When Lieutenant Uhura, Frodo, Yoda, Jesus, Satan, Joseph Smith, Darth Vader, and the Angel Moroni all converge to sanctify a show, thatâ€™s what I call a quorum. By Trey Parker, Robert Lopez, and Matt Stone.